Oetzmann & Co. was a furniture manufacturer and retailer in London from 1848 until at least 1947. 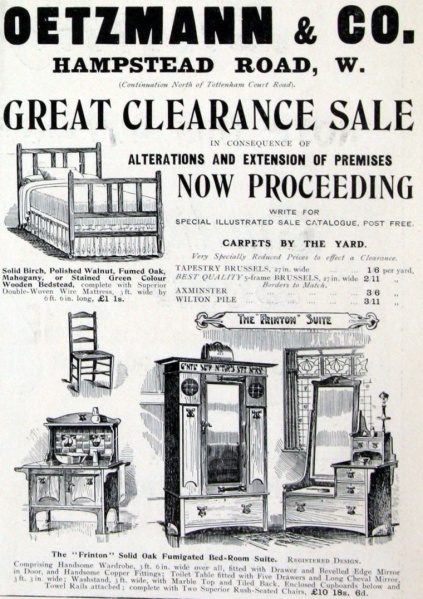 From 1848 the company was advertising as "cabinet makers, decorators and complete house furnishers." 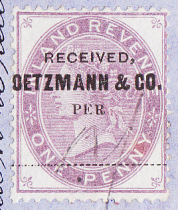 Oetzmann's had extensive trade and manufacturing premises on Hampstead Road and a furniture store on Tottenham Court Road in London's West End. 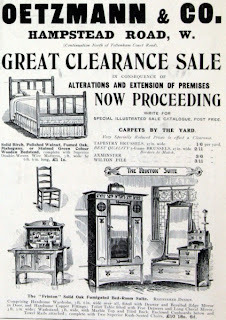 Apart from furniture, the store also sold bedding, carpets, china and glass and drapery. The furniture sold by Oetzmann & Co. was considered "middle of the road", neither too traditional nor too modern, emphasizing price over quality and generally catering to the lower-middle class clientele. Hi - I recently picked up an Oetzmann & Co bureau (the original sale ticket fell out when it was turned upside-down!) and on a little hunt came across this article, so it looks as if they moved into Tattersalls auction building after the war until 1955. My card says "Home Furnishers for over a century" est 1948 and residing at Tattersalls and presented by "R Smith". Their telephone number was "Kensington 6106. Lewis Berger & Sons Ltd.
William Walker & Sons Ltd.